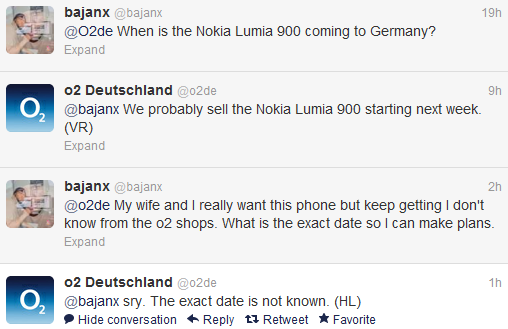 We originally posted that the Nokia Lumia 900 would become available through O2 Germany some time last week, actually. Now, it seems the release has been pushed back for, essentially, sometime in these final days of May. Sources around the Internet, such as Amazon Germany, now list stock of the Nokia Lumia 900 being available on May 31st. 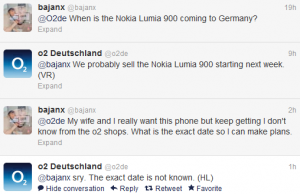 Most importantly, O2 Germany’s Twitter handle responded to the availability of the Lumia 900 set for some time next week. It seems the Lumia 900 is being elusive as ever with it’s arrival in Germany through O2. Hopefully it stays within the May launch window at least. The Lumia 900 will sell at €541 unlocked or €22.50 for a 24 month purchase plan. The Lumia 900 will be available in black, white and cyan. O2 will be running a specific promotion for the white Lumia 900 under the “White Sensation” title. The Lumia 710 and Lumia 800 will also be included in the “White Sensation” promotion. Welcome to our world. Us UK o2 customers have been waiting since April for the Lumia 900. Was then told May 14th. Now we have no idea when its coming!